The Lowe Family News: all dressed up - little brown dude. all dressed up - little brown dude. i'm switching things up a tad this week. prepare to be mega jealous of me. go here to find out how to play. i have this teeny weeny guy. and he's pretty much 6 today. i decided to give my miah all the attention. i learned something about my sweet miah during this shoot. he is 100% GQ quality. i mean i knew he was handsome. but this kid has got it goin on. those paisley shaped smiley eyes? you can't get more adorable than that. so i snapped a shot of the star student board we made. it sums up miah to a 'T'. except for the bona fide gangsta part. we forgot to include that. he's not only incredibly good looking. but he's also quite agile too. everyone likes an agile kid. straight model face with pouty lips? i barely had to coach him. hair: 3-4 different products to achieve perfected faux hawkness. 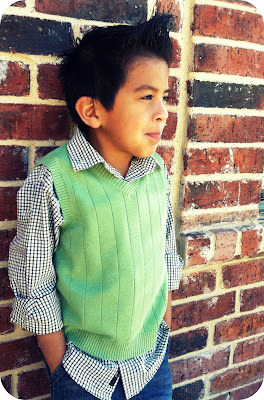 green sweater vest: hand me down. yummy brown skin: cannot be bought. delicious to the taste. happy 6th birthday my sweet boy. for making me such a lucky mom. I have dreams of being his Aunt By Marriage, no kidding. CRAP. I could have a kid and he could like younger women when he is older and then we could be mother in law's to each other's children! Happy Happy Birthday Mr. Miah! And holy cow, why is he so dang handsome?!? And i seriously had a tear when i read your post. I love how you said hand picked by your heavenly father. so sweet. what a beautiful story! i was just about to go to bed and ended up reading this first - so glad i did. love love love the spirit of a child being 'hand picked' to be part of a family that clearly adores him. thank you for sharing this! What a gorgeous little man PLUS I have the same shoes, so we are probably related because I am also QUITE gangsta! Gorgeous outfit, gorgeous pics, gorgeous family. Thanks for sharing, Hussy. Happy Birthday to him. Seriously those are great pictures. Looks like a natural model on your hands! i'm so glad you did this for All Dressed Up, he is so handsome and what a sweetie!! i luv everything about him, especially his effortless GQ'ness. miah.. i wish i could steal you. you would fit in our family perfectly. i've always felt a connection to you.. i'm sure we did cool, GQ things in heaven before we hung out here. Happy birthday sweet Miah! What an adorable little man you've been blessed with. My favorite picture by far is the last one of him holding your hand. Priceless! I love it. Ha!! I knew it. 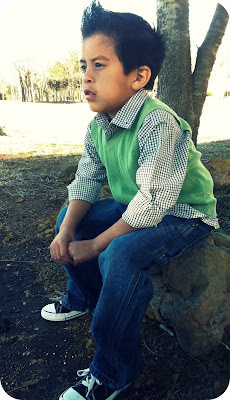 Sweet little brown:) The introspective thinking pose is my favorite. Your kids seriously have the best style! Oh my goodness. He is so stinkin adorable! Happy Birthday little man! Dang IT!! This one made me cry!! But happy tears, I cant wait! We just had our brown skin boy hand picked from Heavenly Father join us in December! Lots of happy tears with this post. Love it! wow... he is so adorable!!!! lol... and yes, he is really GQ too. haha. Happy Birthday. And you are right, he is adorable! I was laughing and laughing then you made me tear up at the end. What a mean thing to do ;) Happy Birthday to you handsome little man...does he go for older women cause I have a 6 yr old too. i was JUST thinking of his birthday laying in bed last night. knew it was his month, but forgot he was so close to the beginning. happy birthday miah! j lowe, he looks SOOO grown up now. his face is all mature and his legs all long. time has flown! hubby and I have talked about adoption too..your story is very inspiring and makes me want to even more! He is ADORABLE! Definite model quality!!! He is seriously too cute! Thanks for sharing your story :) I've always wanted to adopt, but just didn't know if I could do it. This has given me great insight into the world of adoption. THX!! Love the sweet tribute to your son! We have just started the adoption process and reading your post about Miah gave me so much hope. Love that he's a little model. So GQ. Such a sweet post. Happy birthday to him! And totally agree... ya can't get any more GQ than him. What a gorgeous little guy! I like the brown skinned boys myself. He's just too cute and will be a heartbreaker when he gets older! Happy birthday Miah!!! he is so completely and utterly handsome and man does he work that camera!! 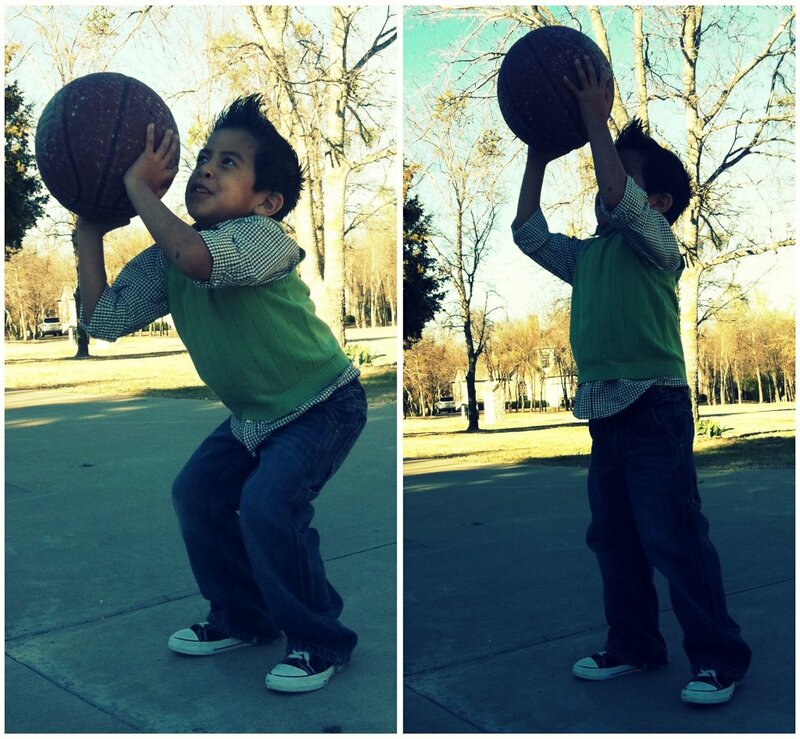 =) HAPPY BIRTHDAY lil Man!! !